My Chemical Romance are the most significant band in alternative rock for the last decade, selling 5 million albums and selling out arenas worldwide until their split after twelve years together. 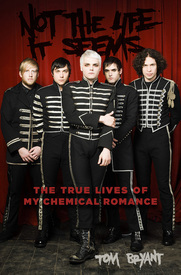 Author Tom Bryant has been given unparalleled access to the band over the course of their extraordinary career and has a unique archive of interviews with Gerard Way and his brother Mikey, Ray Toro and Frank Iero, as well as their friends and those closest to them, allowing him to go behind the scenes and bring their stories to life. ​From their New Jersey beginnings to international superstardom, from the demons they have battled to the power of their lyrics and their extraordinary connection with their fans, this is the definitive biography of the most adored rock band this century, a story of self-belief and the pursuit of dreams.